Windsor ON: ENWIN is featured in three stories in The Globe and Mail Perspective insert, which was distributed to over 400,000 readers across Ontario, Montreal and Winnipeg on Friday. 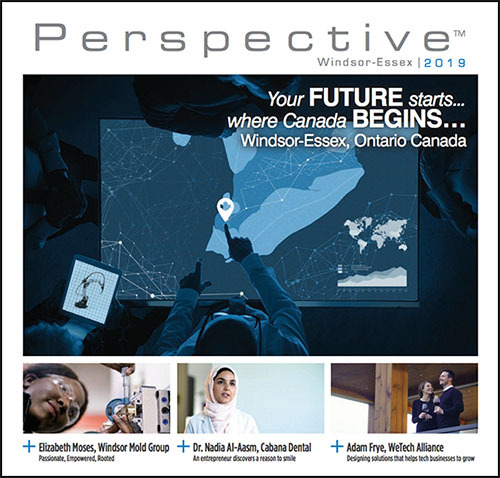 The Windsor-Essex edition is published annually and supported by the Windsor-Essex Economic Development Corporation (WEEDC). It highlights our area's excellence in areas such as innovation, education, lifestyle and tourism. "ENnovation - ENWIN and WEtech Alliance Nurture Innovation" featuring our ENnovation Catalysts, on page 8 & 9. "Powered by Community" featuring ENWIN Vice President of Finance and CFO Bryon Thompson, on page 13. "New Company born of UWindsor Research" featuring ONtech Rapid Coatings Inc., on page 19. A video featuring Vice President Finance and CFO Byron Thompson can be found here. These stories will also be posted on the WEEDC and Perspective websites. The videos are available on YouTube.com/WindsorEssex.